These stunning corporate ecards design shows a beautiful image of a magnificent waterfall somewhere breath-takingly exotic and remote. The rainbow touching the mountain finishes the shot incredibly. Wouldn’t we all like to go there and get away from the ‘rat race’! The message highlights this point and you can’t help but smile at the words as it’s so true. Sometimes it’s hard to let go, but when you do it is so worth it all! 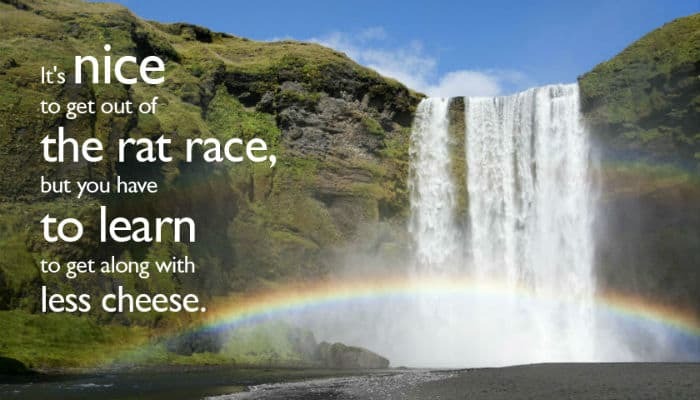 Life would certainly be sweet if you did get away from the rat race, even if you had to learn to live with less cheese! This design is sure to get your customer, colleague or loved one thinking. It could really make someone’s day and without doubt put things into perspective. Sometimes this kind of message translates better than any other. Here at Ecard Shack, we appreciate the importance of translating the right message and how this can make a difference to someone’s day. Please feel free to register an account with us completely free of charge and see how easy it is to design one of our e cards. There are so many designs to choose from and you are more than welcome to design as many as you like. We have a customer support team ready to help if you need any assistance. Why don’t you stop by and have a look at our electronic Christmas cards for business while you are here. You will be amazed at how we can transform your Christmas holiday marketing.